It's finally starting to warm up this way (yea, watch me type that and then a polar vortex head into town). Show season has started and the students competing at the schooling show are doing very well! That said though, Ariel is one of the horses at the shows so I'm riding Molson for a full dressage lesson. I've never ridden in a dressage saddle before so I thought this was a great chance to try something new. All I know about dressage saddles is that they keep you more in the seat and you're meant to sit deeper and your leg is 'longer' and straighter than in a jumper saddle. First things is first though, Molson's rider doesn't have to be as crystal clear with their body and he rides with way more contact. One of those things I'm thankful for and the other, I'm rethinking whether I like that better or not. It takes some time for me to understand how much contact I should be having with his mouth because I'm used to such light contact with Ariel that I hesitate to push more on Molson. J tells me that Molson can be ridden with a lot more contact so I spend the better part of the lesson trying to figure out what that might be. I also work on trying to get him to frame up. The entire lesson was spent on me going around and around (Molson must have been okay to go on autopilot!) at the sitting trot because I found posting trot to be more difficult to accomplish in the saddle. We spent time on trying to move with their bodies at the trot which remains elusive even at the best of times. I found moments where my body was absorbing his movement and going with things but the second I tried to do something else or when Molson sped up, I'd lose it and had difficulty getting it back. We were told to include half halts (checks) at each letter in the arena to rebalance the horse and to ensure that we're where we're supposed to be. I'm also trying to get Molson into a frame which proves to be challenging. That full body half halt is elusive because timing it with Molson is also imperative so I don't lose my seat. But, it is particularly effective and he does compact more. Another exercise we try is to half halt them into a transition down and a stop where the objective is to get them to compress into a transition/halt versus falling onto the forehand to transition down. Molson is particularly accommodating but he isn't schooled nearly as well as Bons and it proves to be difficult. Due to my determined nature (that's what I'm going with! ), I rode the sitting trot for the ENTIRE hour while transitioning up and down (no canter this lesson) throughout the arena. Not often gracefully but I kept at it for the whole of the hour trying to get that position and the movement that I needed to get for dressage. It isn't easy but I totally can't wait to get back to lessons twice a week!!! I'm glad you enjoyed riding in the dressage saddle. It takes time to get the right position and movement right, and I too can't keep it right the entire time. Best of luck with your lessons! thanks!! the dressage saddle is REALLY new to me and i can't believe how much different i felt it was. i'm so used to riding in the hunter/jumper saddle that it feels like something vastly different! omg a whole lesson in sitting trot!?! you must be sore haha! 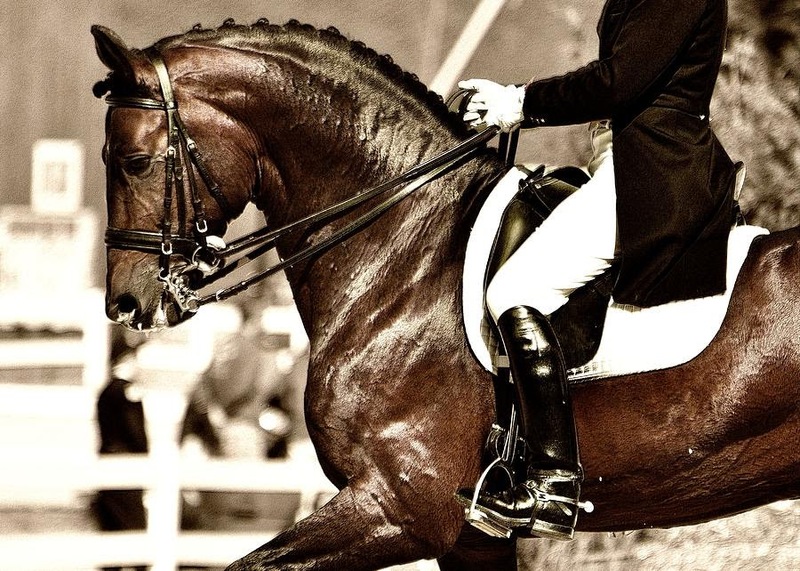 i've never tried a dressage saddle either, but really want to -- it supposedly make such a difference! hey you! i didn't see you today; hope all's well! molson is a wonderful guy and so chill (such a huge difference from that sassy mare i usually ride!) and just happy to putter around. i wanted to try something different since j offered and i'm happy to try most things at least once and see if it's something i'd do again. i'd definitely do it again!! p.s. not sure about doing the show... i don't know if i have the confidence to get up to that point... but i have been looking at it so i haven't ruled it out! if nothing else, i will go watch and help you out that day!